We were one of the first online company formation agents in the UK and we are a registered electronic filing agent with Companies House. We have formed thousands of limited companies and we are the only UK company formation agent to offer free company formations. What really makes The Company Warehouse stand out from other company formation agents is the wider support we provide to new startup businesses. Every business that we have contact with is allocated a Business Consultant who is available to answer questions on the phone, by email or through our online ticketing system. We have put together specialist accountancy support packages for startup businesses. We have our own in-house team of accountants and bookkeepers who can help new businesses with the finances. We provide specialist bookkeeping software, undertake PAYE and VAT registrations, run payroll and do end of year accounts and filings. Because we have all of this expertise in-house you can be sure that we will be able to answer any questions you may have about company formation and finances. Our in house graphic designers provide a bespoke logo and corporate identity design service for our customers. They can help make sure that your business has the right brand image to make a great impression on your new customers. Getting your new business online is now an essential step for startups. The Company Warehouse are a Nominet Accredited Tag Holder, the highest level of domain name seller in the UK. As well as selling and managing domain names we provide business email services and have our own team of in-house web designers, developers, content writers, social media and SEO specialists. Along with your business consultants they can help with all aspects of getting your business online. The Company Warehouse are an Ofcom range holder. That means that we have our own set of exclusive phone numbers for use by our customers.We can set you up with cloud based digital receptionists, 08 numbers, local geo number for any town or city in the UK, number presentation services and lots more. When you form a company with us, or register on our website, you will get access to the My Company Warehouse control panel so you can manage your business online. My Company Warehouse is where we will make your company documents available to download and where your registrations such as PAYE and VAT will be updated. If there are any documents you need or any additional registration then these can also be requested through the same area. 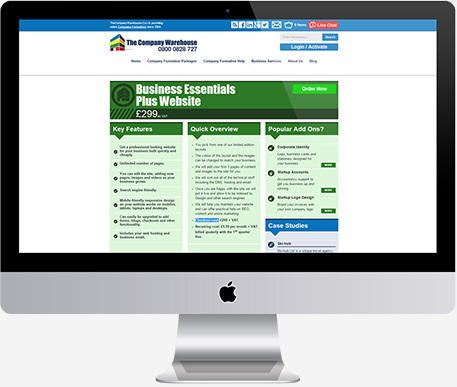 As well as managing your company formation details My Company Warehouse allows you manage your website, access your email and update your 08 phone numbers. We are adding more services and functionality to My Company Warehouse all the time to meet the needs of new and growing businesses.